man, i really hate coding. i'm trying to get my portfolio updated and... its frustrating. i could go on and on, but i won't. the good news is that i should hopefully have fresh new portfolio up in the near future. i'm also on the verge of finishing up a project that i've been just very slightly working on for a long long time. its almost ready to show. i've decided to post a little bit of personal memorabilia from the coraline production in honor of the dvd release this tuesday. 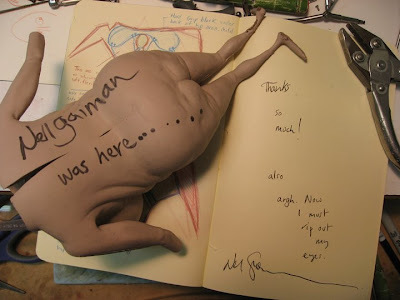 neil gaiman came to visit the studio a couple of times and signed stuff for us on both occasions. i got him to sign my copy of the coraline book on his first time through, so when he came back i had to scrounge for something for him to sign. so i improvised. i think it worked out well. i got him to sign my sketchbook and a test casting of miss forcible. that's what i had to look at all day for several months, by the way. maybe you can corner george and try to get her to explain how they made those crazy head mechanics on corpse bride. if you do, tell her i sent you! it's my favorite movie, out of every movie i've seen, and i've been watching the making of this movie since it started 2 years ago, online looking for updates all the time..
i really wish i can win something from coraline! I know how you feel kim. I live in the united kingdom and not one peice of publication or publicity of this film was made here and to make matters worse when the movie came to our ccinema the nikes dunks and bobinskys blog had both closed so no chance to win. Your so incredibly lucky to have worked on such an incredible film and to have that! Na im joking lol well dont your so lucky"
i wish i had something to give you both, and i'm sorry the dunks were not available in the UK. i'm very happy to hear how much you enjoyed the film. literally hundreds of people worked very hard to bring it to the screen. thank YOU for watching.